Synopsis: Reality TV fans, racers, and just plain destructive people in general have a reason to unite with the new racing title, Split/Second. Disney Interactive got us our review copy on Friday, so we got a few days without multiplayer to unlock new cars for when multiplayer racing went live Monday night. 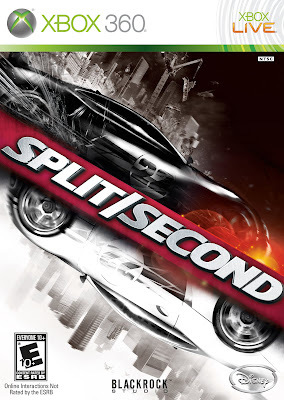 In Split/Second, you are a driver in a reality TV series show, where racing takes place in a destructible environment and your goal is to complete the season and become the champion. Explosive events and power plays triggers which, when timed right, take out opponents and alter the track are rewarded for drafting, drifting, close calls, and catching air. These trigger are what separates this title from other recent racing titles. The season is made up of 24 episodes and each episode has a number of events to play through to unlock the next episode and specific requirements to unlock additional cars on your way to become champion. Let’s get to the review so I can get back to playing online. Praise: Racing fans rejoice because this is all you will need to cure your itch for fast paced near flawless racing. This is not your typical racer, it’s like Burnout and Grid, made a baby and Blackrock Studios shows their love for their work when playing through this. 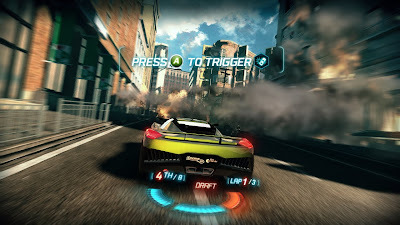 Whether you are into single player, two player split screen, or online play, you will enjoy all that there is too offer as there are numerous race modes to prevent single player from getting old and racing online has not lagged for me at all. There are a variety of cars and each handle significantly differently focusing on different things like drift, speed, acceleration, and strength. Rather than unlocking the newest car and only using that, it is helpful to change up your cars for the different type of events to help your chances of becoming champion at the end of the season. Outside of the gameplay aspect of Split/Second, the looks and sounds are like you are watching an actual race, especially with the very minimalistic HUD. Another new feature that is a great way to show off all your achievements to friends and rivals is that the achievement pictures are placed on your car as decals. Oh yeah, it’s also nice to have more explosions than a Transformers movie. Gripes: A few features and issues that I wish were different in the game is a very short list. There is no vehicle modification outside of visually, as it would have been nice to have some sort of performance modifications available to make to the cars in your garage. 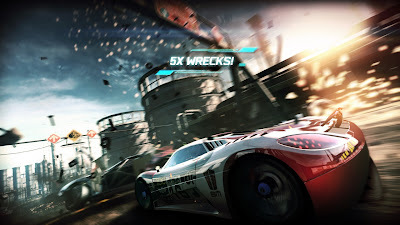 Though there are a number of events, about halfway through the game, it does begin to feel a little repetitive, but the motivation to unlock better cars to play in multiplayer does make it so you want to complete the season. The lack of licensed cars is something I feel took away from the title as most games nowadays have licensed vehicles and not generic vehicles made to have a “similar” look. Finally, the opponents on the single player mode rubber band constantly, as it seems no matter how well you race or how many cars you take out, the other racers always seem to be right on your tail. Overall, this is a game where you come for the single player season but stay for the online races. With a huge replay value as long as you have an Xbox Live membership that allows you to play online you will be coming back for a while. There are only a few online modes but how often do you get race in a remotely destructible environment, having races that only last a couple minutes each, and enough online support to minimize the amount of lag when online. Little issues aside, this is a game that is just plain fun, not having to worry about getting through a story, just plain racing, so if you like your games with that good arcade feel, it is definitely worth the purchase. Mashbuttons.com gives Split/Second a 9 out of 10. Split/Second is available now for the Xbox 360, PlayStation 3, and PC.